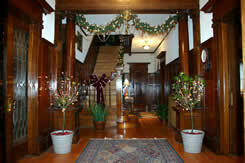 Armstrong's Point in Winnipeg is a heritage home district with a history stretching back 125 years. It is a river peninsula consisting of three streets: West Gate, Middle Gate and East Gate. The Assiniboine River wraps around East Gate and West Gate. This fully treed community is beautiful in every season of the year. One can enjoy the full bloom of summer with the warm sun filtering through the green canopy of 100 year old elm trees, through to the breath-taking scenery of hoar frost winter white tree lined streets. 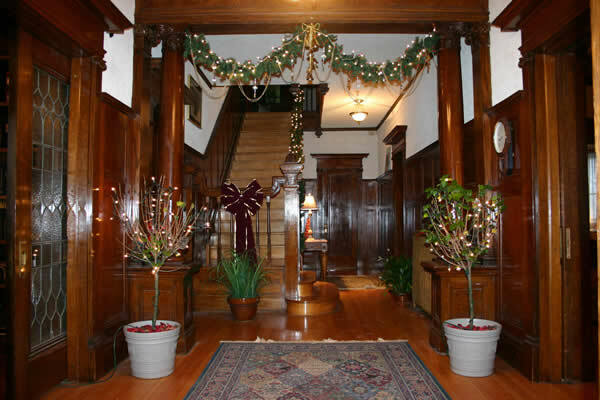 The Columns is a heritage mansion, built in 1906 on treed river side property on East Gate. At the base of the garden, there is a bicycle/walking path that leads to the popular Forks area in downtown Winnipeg. 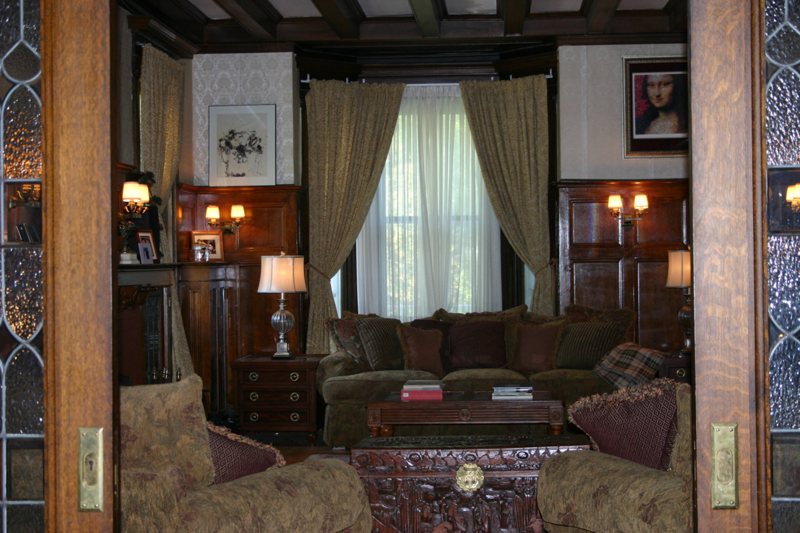 The house has been renovated by the current owners. Today, 5 East Gate contains luxurious guest rooms with en suite bathrooms, 4 outside decks, 2 enclosed porches, a panelled living room and dining room separated by bevelled glass sliding doors, a library, and laundry facilities. Beautiful original quarter cut oak paneling graces the major walls of the main and second floor complimented by gleaming oak floors. 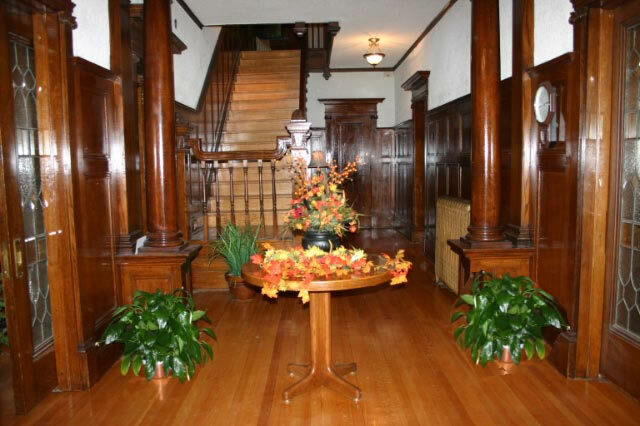 The foyer boasts 12 foot oak pillars. Down-filled living room furniture and silk carpets invite guests to a cozy evening by the fire. The dining room is gracious dining at its best. 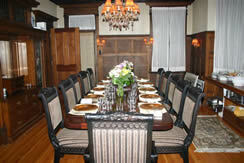 Breakfast is served in the dining room during the winter months. 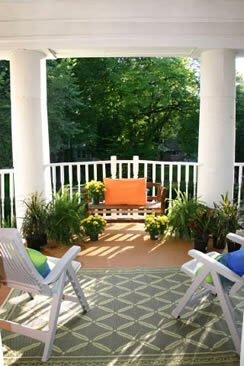 In the summer, breakfast can be had on the river view deck or in the outside dining room. The Master Suite has 1000 sq ft of private space and includes a private patio - perfect for special occasions and honeymoons. The Columns had the privilege of being chosen as a location in the following two movies made for TV. in a treed urban oasis.